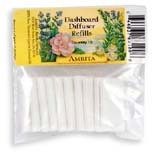 Dashboard Diffuser Refill, 10 Pads (Amrita Aromatherapy) - Penn Herb Co. Ltd.
Stay Alert & Fresh While You Drive! Amrita's Dashboard Diffuser allows you to refresh your driving environment with the cleansing, invigorating influence of pure essential oils of your choice. Simply add your favorite essential oil to these cellulose cartridges.